Lagers require higher pitching rates than comparable ales, and higher-gravity beers require more yeast than beers with lower starting gravities. 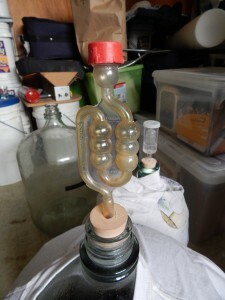 So, a Maibock yeast starter will need to raise enough yeast for a 16–18 °Plato (SG 1.064–1.071) lager. This is a big yeast starter. If you’d like, you could brew 2.5–3.2 gallons (9.3–12 L) of a light helles, or other light lager, and use the yeast from that small batch of beer to pitch your Maibock. This way, you’d up with a little extra beer and wouldn’t have to pour out a large volume of starter wort. For the best results, make the “starter lager” a little lower in gravity than the style guidelines dictate. For example, if you make a helles, the lower end of the OG range is 1.045 (a little over 11 °Plato). For your starter helles, dropping the OG to around 1.040 (10 °Plato) would help. Pitch more than the required amount of yeast to the starter lager. A 3.2-gallon (12 L) lager at OG 1.040 would normally require a 1.7 qt. (1.6 L) starter, but pitch 10–20% more than that. A 2-qt. (~2-L) starter would work great. (In essence, you’d be stepping up the yeast twice — once for the initial yeast starter and again when brewing the starter lager. Finally, ferment the “starter lager” at the high end of yeast’s recommended temperature range. You want to do everything you can to make the fermentation of this starter beer easy on the yeast. Expect the primary fermentation of your “starter lager” to last about 10 days, if you follow the advice above. After your Maibock boil, chill the wort down to 50–55 °F (10–13 °C) — or whatever your target fermentation temperature is — and aerate the wort well. (Here’s an easy way to chill lager wort.) Then, pitch your yeast. Obviously, you will only be pitching the sedimented yeast from your yeast starter (or “starter lager”), not the entire volume of liquid from the starter. When pitching the yeast, ensure that its temperature is within 10 °F (5 °C) of your Maibock wort temperature, or the yeast may be shocked by the sudden change in temperature. An easy way to do this is to keep the yeast from the yeast starter in your fermentation chamber until you are ready to pitch. As an option, you can also cool the wort to a few degrees below your target fermentation temperature and let the heat from fermentation warm it up. In order for this to work, you need to have pitched an adequate amount of yeast and not be below the working temperature range of the yeast. The typical lager fermentation range is 50–55 °F (10–13 °C), although some of the strains listed above also work at slightly cooler or warmer temperatures. Anywhere within this range will work well for a Maibock. When fermentation first starts, ensure that the temperature does not spike out of this range. You may need to lower the temperature in your fermentation chamber or directly cool the fermenter on the days when fermentation is most active. Be sure to monitor the temperature of the beer rather than the temperature in your fermentation chamber (or basement). As the fermentation winds down, allow the temperature to rise — up to 60 °F (16 °C) — for a diacetyl rest. During this rest, the yeast will absorb any excess diacetyl and yield a “clean” lager aroma and flavor. If you skip the diacetyl rest, the beer may have a buttery or butterscotch character to it that is not wanted in a lager. Excessive amounts of diacetyl are also associated with slick mouthfeel. Keep the beer at the diacetyl rest temperature for at least 3 days, then you can rack the beer to a keg or secondary fermenter for conditioning (lagering). A very rough rule of thumb is that primary fermentation in a lager will take 1 day for every degree Plato of original gravity. Obviously, this is influenced by the fermentation temperature, pitching rate, level of aeration, and yeast strain. However, it does give you a ballpark estimate of how long a well-run fermentation should last. Another rough rule of thumb for lager beers is that they should be lagered 1 week per every degree Plato. In the case of a Maibock, this would be 16–18 weeks. If you pitched an adequate amount of yeast and had an ordered fermentation, you should not need to lager longer than this. Lagering your Maibock in a keg is an excellent option. You can even let it sit at serving pressure so it is carbonated and ready to go when the lagering period is up. You can also sample the beer as you approach the end of lagering. Although you can lager in bottles, you’ll probably be better off lagering your beer in a secondary fermenter if you are going to bottle it. You can lager the beer at temperatures near freezing, or just let it lager at refrigerator temperature. If you are going to bottle condition the beer, you may want to add some fresh yeast when you bottle. Any lager strain (or even neutral ale strain) will work for bottling and not change the character of the beer established by the primary yeast. With the exception of needing to raise a lot of yeast to pitch, brewing a Maibock is straight forward. A great Maibock comes not from a convoluted recipe, but rather from quality ingredients and a skilled brewer. It may seem hard to imagine now, but Spring is not that far away. Brew your Maibock now so it will be ready temperatures rise and everything starts turning green again.